The sage sat in his wagon reading a book. 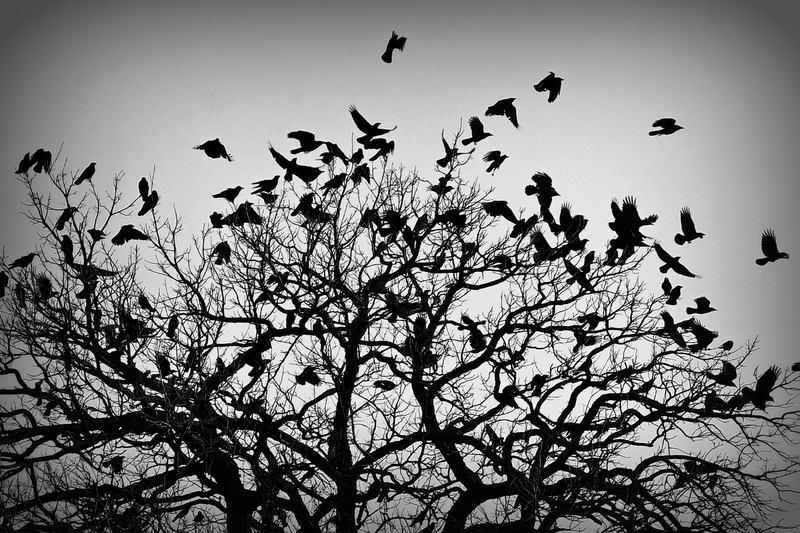 Outside a murder of crows descended cawing at the darkening sky. He looked up. About a hundred crows settled into the trees around the wagon. "Hmm... evil approacheth, me thinks," said the sage to himself. "What to do?" He considered staying in the wagon and hiding. That wouldn't do. Evil thrives when good men do nothing. But what was there to do? "I can try a Thunder Hand Clap and scatter them, I suppose," though that wasn't likely to do the trick, and once played and lost, the crows would become convinced that their enchantment was working. That wouldn't do. So he lifted his creaking bones and climbed out of the wagon, thinking "There's only one thing that will help against Evil such as this... I will pray to the God of Love. He will hear my prayer and send some aid, I think. After all, we can't allow evil to prosper in the land. That would be bad." And so, he stood beside the wagon observing the crows as they swarmed in groups on the trees and in the air, their cawing growing into an ever louder cacophony. In one of the small young trees right next to the wagon were a few sparrows, staring silently into the air. They seemed a bit terrified. The sage loves sparrows. They remind him of his lady, who said if she could be any animal it would be a sparrow. He smiled. "Chit-chit-chit" he clicked with his mouth. "Chit-chit-chit". After a few tries one of the sparrows made a little whistle. He imitated it with a whistle of his own, and chitted again a few times. Another sparrow whistled, and one chitted. A conversation began, and the sparrows began to whistle and chit with the sage. It seemed as though they were in a world of their own, and the crows had no power there. The sage was smiling, and enjoying the conversation. He hadn't spoken with sparrows for a while. They're such fun little folk. "Now, what to do about these crows?" he asked himself. He was chewing on a mint leaf as he contemplated. "Oh I think I will try a Breath Weapon. Why not?" And so, as the clouds began to rumble, and the crows flocked in a huge mass on one glowering Hawthorn, the old sage drew a large breath into his lungs, and began to blow Minty Breath towards the darkest part of the murder ... suddenly, before the breath even had finished, the entire black flock launched into the air, and without a single caw flew in a wide arc into the sky, and over the hills and vanished away beyond the tree line over yonder. The old sage smiled at the sparrows, but they had also gone by then. He was alone in the forest. Not a sound could be heard. He felt a wonderful sense of calm, and the air seemed fresh and filled with a sweet scent... and so he climbed into his wagon, picked up his old book, and continued the story where he'd left off. And a good story it was.